Barrie Colts: 2018-19 OHL Coaches Poll. #OHL - Very Barrie Colts | A website covering the Barrie Colts of the OHL. 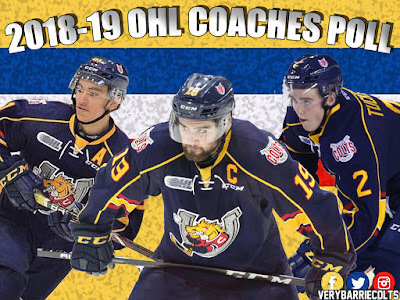 The Ontario Hockey League has released the winners of the 2018-19 Coaches Poll. The poll allows coaches the opportunity to recognize three players from both conferences. There are 20 different categories included. Three Barrie Colts players made six of the categories for the Eastern Conference. Here is a look at who placed and where. For the complete list of all 20 categories, you can find it here.